Thinking of hauling your out-of-town visitors to Tofino for some whale-watching? Think again. This summer, four local tour operators are guaranteeing sightings with departures right out of the Lower Mainland. Vancouver Whale Watch and Steveston Seabreeze Adventures (both departing from Steveston), Wild Whales Vancouver (from Granville Island), and Pier’s End Adventure Centre (from White Rock) are all offering boat tours across the Strait of Georgia and down to the Gulf and San Juan islands to watch the whale pods play. When the tour operators claim “guaranteed” sightings, they promise that if you don’t see a whale on your day out, you can return on another trip without charge. Because the animals are not electronically tagged or monitored, the companies share daily sightings with shore watchers and scientists by phone, radio, and Internet. As affiliates of WWOANW (Whale Watch Operators Association Northwest), they join the eyes and ears of almost 30 other Pacific Northwest whale-spotting operations. Involvement with WWOANW also ensures that everyone follows the organization’s best- practices guidelines for minimal noise, speed, and exposure when entering marine animals’ environments. Seabreeze, Wild Whales, and Pier’s End send out covered and open-air aluminum vessels that carry 12 to 45 passengers and average about 22 knots (40 kph). Vancouver Whale Watch-the longest-running of the group-runs 12- and 38-passenger rigid-hull inflatable boats that hurtle across the Strait at speeds of up to 32 knots (60 kph). National Geographic recently photographed their bright-red Zodiac-style boat with matching splash-suited passengers for an April 2005 feature. All four companies supply on-board necessities (bottled water, snack bars, and toilets) and- proving they’re more than mere boat rides-throw in eco-interpretive amen?ities such as binoculars, charts, maps, and underwater hydrophones to listen to the whales’ aquatic chatter. An on-board naturalist helps makes sense of it all (including the toilets) and won’t hesitate to idle the boat for photo ops of eagles, seals, and sea lions. Not surprisingly, whale-watching tour operators report that-probably with the help of hotel pamphlets and shuttle pickups-tourists are much more likely to know about these day-trip adventures than locals. If you live in the area and haven’t visited your oceanic back yard lately, maybe this is your summer to catch up with Granny and the pod. 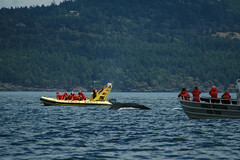 Lower Mainland whale-watching tours generally operate from April to October, but the best viewing season starts around June 15 and runs into September; the tour operators schedule both morning and afternoon departures. Trips are usually three to five hours, cost about $100 per adult, and reservations are recommended. For specifics, call the companies or visit their Web sites as follows: Vancouver Whale Watch, 604-274-9565, http://www.vancouverwhale watch.com/; Steveston Seabreeze Adventures, 604-272-7200, www .seabreezeadventures.ca/; Wild Whales Vancouver, 604-699-2011, http://www.whalesvancouver.ca/; Pier’s End Adventure Centre, 604-535-5455, http://www.piersendadventures.com/. For information on orca sightings in the Pacific Northwest, visit Orca Network at http://www.orcanetwork.org/. To learn more about WWOANW, its members and best-practices guidelines, visit http://www.nwwhalewatchers.org/.